In preparation for my recent trip to Door County, I am really amazed by the number of cultural offerings, particularly during the high season. I was so impressed with the quality of the performances that I attended nightly, from theater, classical music and jazz. Make sure you attend a performance while there. 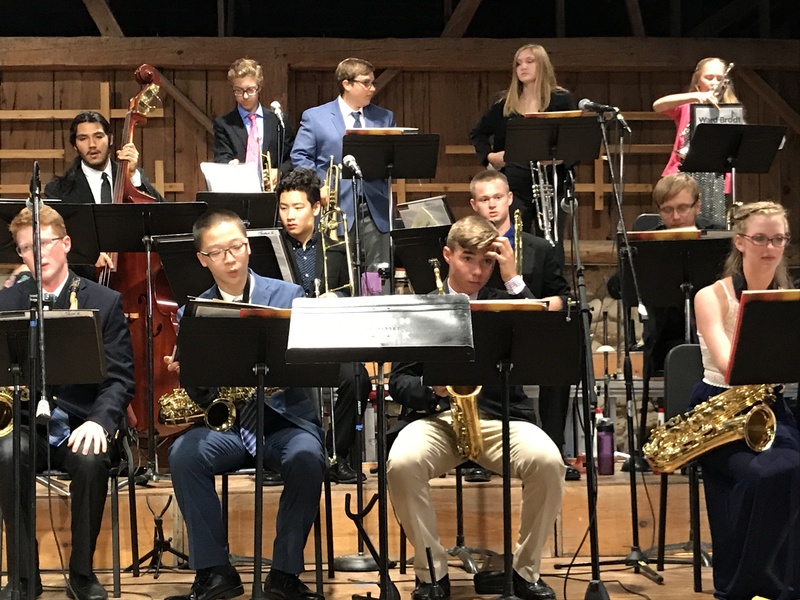 The Birch Creek Music Performance Center is a summer music academy and concert venue, since 1976, that features faculty/student performances in percussion and steel band, classical and big band jazz from June thru August. It is located 3 miles east of Egg Harbor on Hwy. E. I was extremely impressed with the overall setting and the wonderful quality of the performance. I enjoyed a concert, Swinging Through the Ages, which featured a student orchestra as well as the faculty orchestra. Both were outstanding!! They also offer special concerts throughout the year including a Fall Series of concerts. Peninsula Players at The Theatre in a Garden: This is a Door County institution for over 82 years with summer performances six nights a week. When I was there they were performing a musical of The Bridges of Madison County as one of their four summer productions. It was a great performance and evening in a perfect setting along the water. The season lasts from mid-June to mid-October. Northern Sky Theater: This local theater performing original musical comedies under the stars in Peninsula Park in Fish Creek. The summer season is from mid-June to the end of August. They also perform one musical in the fall and one at Christmastime during the holidays. I was planning on seeing the popular Lumberjacks in Love, but due to rain I had to change my plans and cancel. Peninsula Music Festival: For over 65 years, the Peninsula Music Festival has been a popular August cultural event in Door County. I enjoyed a classical concert presented by the Peninsula Music Festival featuring works by Brahms, Berlioz and Beethoven. The orchestra was very professional. The venue is the Door Community Auditorium, Fish Creek, that offers a number of concerts from blues to jazz, dance performances, theater and other events. Midsummer’s Music Festival: This is a summer chamber music festival that offers concerts in unique settings. These include galleries, restaurants, churches, museums and private homes. Here you can be near the musicians, enjoy a glass of wine during the receptions and mingle with the artists and other audience members. Door Shakespeare: This is a performing arts center in Baileys Harbor. They focus on the plays of Shakespeare with performances from the end of June to the end of August. Write On, Door County: Located southeast of Fish Creek, this is a center that features classes, events for all experience levels and ages as well as a writer’s residency program. Peninsula School of Art: This art school offers art classes from May through October for adults, teens and children. The workshops range from painting, drawing, ceramics, photography, printmaking, cartooning and mixed media and sculpture. They also host the Door County Plein Air Festival in late July through early August. 3900 County Rd. F, Fish Creek. Trueblood Performing Arts Center: This is a performing arts center on Washington Island with music performances from classical, jazz and country plus film and lectures. They also host the Washington Island Music Festival in August and a literary festival in September. Skyway Drive-In Theater: Located north of Fish Creek, this is a popular drive-in.